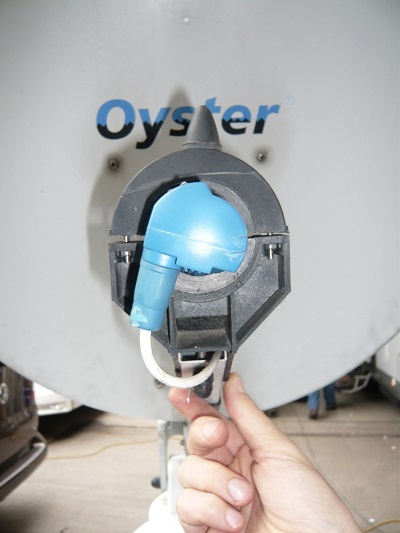 If your Oyster Vision 1 dish is spinning and not finding anything there are some solutions that you should be aware of. Astra SES have been making changes to the satellite array which means that automatic satellite dishes require transponder updates to enable them to find the satellite and lock on. Ten Haaft, the manufacturer of Oyster systems are no longer able to support the Vision 1 with software as there is no more space on the microchip for more information. The Vision 1 was discontinued at the end of 2005 and replaced with the Vision 2. Some Vision 1 boxes will be able to have one more update (if you haven’t already done one in the last 12 months or so) Check your chip inside the control box to see if there is a software upgrade available, if you can upgrade the chip needs to say ATMEGA128 and not ATMEGA103. – for further information about this we recommend you read this blog post about how to check your chip. Upgrading the software is only delaying the inevitable because as soon as there are any more updates necessary for the transponders or software even the 128 chip will be full. At this point your only option would be to upgrade to a Vision 2. The best thing you can do to future-proof your Oyster (at least for the next 5-10 years) is to upgrade to the newer Vision 2. You can do this simply by trading in your V1 control box and in return receive two new V2 control boxes, usually the boxes cost £710 but for V1 customers we are able to do this trade in offer and sell the boxes for £500. For further information on this, take a look at our website where you can order the boxes: http://www.conrad-anderson.co.uk/products/view/satellite-tv/automatic-satellite-dishes/Oystervison2conbox or you can call us on 0800 279 0085 or 0121 247 0619 to arrange the trade-in. If you use a Sky box and not a Free to Air or Freesat box, upgrading the software will not help, as sky boxes won’t allow you to change the channel without a signal. Your only option in this case is to upgrade to Vision 2. See bullet point 2, problem 2 further down the page for further information on this. Below is some information on service intervals and troubleshooting. Installing the new boxes is very easy, and is something that most people will be capable of doing at home as it’s just a case of unplugging the V1 box and plugging in the new units while remounting them to your camper. However it is a good time to see if your Oyster is due a service, if you’ve noticed the dish creaking or the picture breaking up then these are signals that its dues some TLC. From brand new - If making plastic squeaking noises on elevation – Vaseline on bottom of the black cone on underside of LNB arm and the casing where it rests. This is something you can do yourself. The rest of the service intervals need to be performed by ourselves or an authorised Oyster dealer. Over 3 years old – Annual visual check of the insides to look for broken seals, any damage to cogs and pins. Charged at hourly rate of £54 inc VAT plus any parts that may be required. 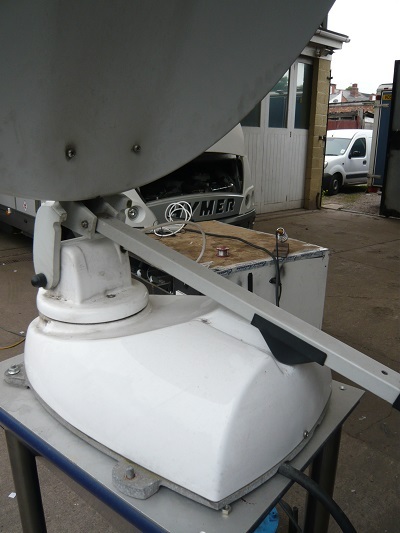 Over 5 years old – Full service, change LNB and main bearing check. Price: £200 + parts, based on 4 hours labour. We keep a good stock of Oyster parts for servicing and all parts are replaceable. Problem 1: Getting pixilation on certain channels. Likely that part of the LNB has degraded, solution: change the LNB. Will be worst in bad weather and then gradually become more apparent even when the weather is clear. Or Skew wrong – the LNB should be in the following position for Astra 2 when inside the Oyster’s footprint area. LNB should be at approximately the 6:30 position if you were looking at a clock face. If the LNB is in any other position and you are inside the footprint for the dish, you should re-align the LNB by loosening the two small bolts on with side of the bracket holding the LNB and rotate the LNB to this position, then tighten the bolts back up again. Problem 2: Dish spins without locking on to signal with no error messages showing on LED display. Most likely to be LNB fault or control box transponder settings. Oyster Vision 1 that hasn’t had an upgrade in the past 2 years, transponder settings are the most likely the culprit – solution: software upgrade. If a V1 that has had an upgrade, select one of the following channels on the satellite receiver to either CNN International, Sky news, The Box or Kiss TV (not with Sky box) before the dish is elevated. Once it has a lock to the channel selected it will find the other channels available, if this doesn’t work or only a few channels are viewable a new LNB might be necessary. Problem 3: Had a new LNB & transponder settings have been updated but still not able to lock on to Sky News or other channels mentioned. Most likely cause is a fault in the tuner of the Oyster Control box – solution: upgrade to Oyster Vision 2 control boxes. If you are experiencing any other faults with your Oyster please refer to your manual or contact us for troubleshooting guidance.